We guarantee listening to This Week’s Powercast will help the on-going salvation of your soul and cleansing of your mind. It will save your weekend AND have a positive influence on your thinking and emotional state going into your next week. To be sure, you will be better equipped to face no matter what life has in store for you. Plus, we heard of how Michael L. Williams became a Kentucky Colonel and found out how YOU can have a FREE Video Meeting with the Founder and President of the Gospel Revolution! We heard from Danny Rogers with a beautiful question on the story of Ananias and Sapphire which led to an amazing discussion between Mike and Don. Among the other beautiful humans we had communication from on this particularly information-packed show were: Shawn Smith, Connie Lynn Nelson, Kendall Brown, Jonathan D. Nicholas, James Gustafson, Vic d’Obrenan, Danny Miniskanians, Pep Washburn, Marcel Roos and Philip P. Brittan, author of “The Greatest Gospel Truth”. 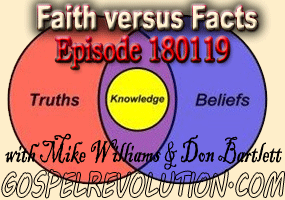 The show concludes with an incredible dialogue about the significant difference between belief or faith and facts! “ATMs in modern churches” – hilarious. . . . Yes the contradictions in the NT are glaring once you step back from the indoctrinations of Christianity. . . . . . Yes, indeed. It is amazing how many Gospel Revolutionaries have written books.